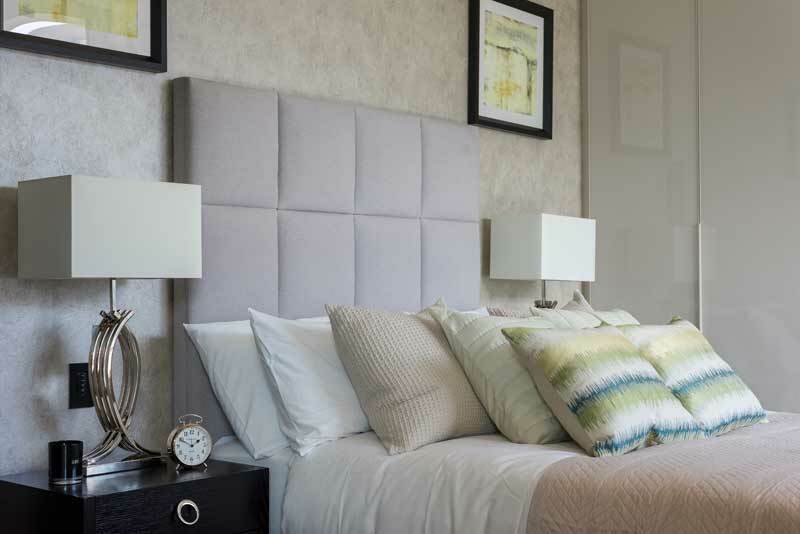 Crisp, modern design flows from room to room at this beautiful two bedroom Earl’s Way property , a recent bespoke furnishing project carried out by the ani M Interiors team. A blend of high-end, contemporary décor and luxurious simplicity creates an interior space that is at once light, airy and irresistible. 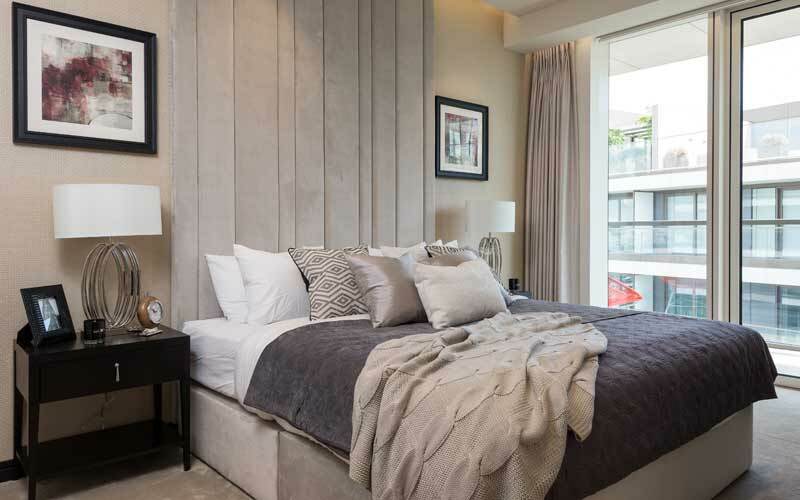 Being a show flat for property developer Berkeley Group, the team set out to achieve a highly aesthetic design scheme, with eclectic statement pieces and vivid accent colours adding charm and personality to every corner – a striking space to match a most prestigious residential location. In the reception area, cool, contemporary style meets quirky flair. A monochromatic palette sets the scene for a luxurious statement sofa, upholstered in rich teal-hued velvet; the perfect piece of furniture to lounge in comfort, and paired with a beautiful array of cushions whose distinct patterns lend a feeling of urban chic. A dark wood coffee table, plush slipper chair and sleek floor lamp tie the space together, while decorative accessories add a unique touch. 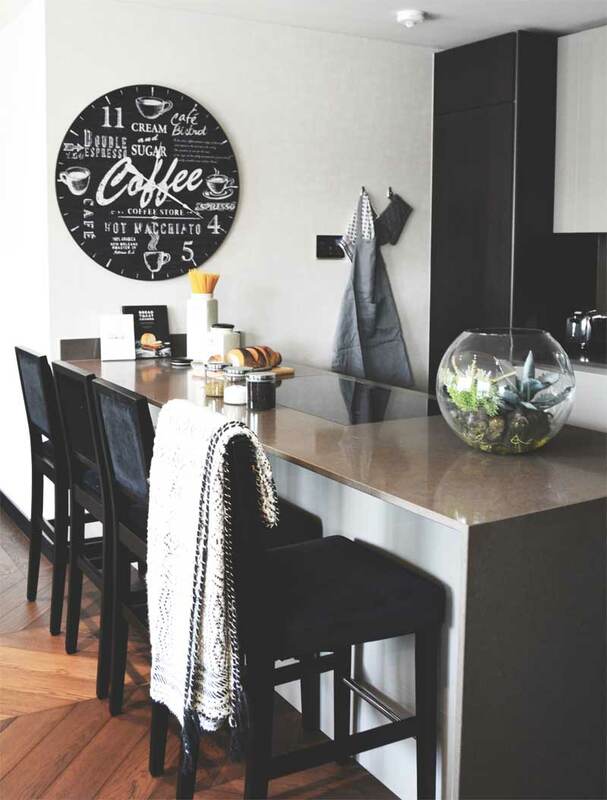 Inviting furniture and décor take precedence at the heart of the home – the kitchen. Luxury bar stools stand tall on slender, solid wood frames, with seats masterfully upholstered with a luxe velvet. A statement wall clock with its playful characters and over-sized numbers makes for a beautiful focal point, and trendy way to keep track of time. The final ingredient for this cosy, intimate kitchen is a succulent display – a gorgeous table centerpiece and natural touch to indoor décor. At first impression, the dining area spells simple elegance with elaborate finishing touches. Boasting sleek, sophisticated silhouettes, beautiful dining chairs sit pretty around an oval table adorned with the finest crockery and silverware. A bevelled glass mirror creates a glamorous, eye-catching wall, and gorgeously complements the cabinet’s silver art deco handles. Tall plants soften the décor’s structural lines and add wonderful life, form and texture to the room. As one of the apartment’s luxury amenities is its outstanding views of Tower Bridge, the team focused on creating a charming outdoor seating area on the balcony. Beautifully crafted Acapulco wire chairs serve as a comfortable resting place as well as a mid-century modern statement piece; their deep, barrel back making the perfect seat to watch the world go by. In the master bedroom, soft shades of taupe and purple create a soothing ambience. From large cushions in striking prints to cosy knitted throws, layers of soft furnishings make the bed a restful retreat, while a tall upholstered headboard lends a regal, timeless quality. Coupled with dark wood accents and elegant lamps, the room combines modern luxury with classic touches. No comfort is spared in the second bedroom. Delicate pastel hues, exquisite fabrics and fine furnishings combine to make a sumptuous haven. Subtle pops of yellow in the cushions and wall art brings an uplifting zest to the room, and nods to the bright, cheerful vibes of summer. A dressing table of utmost elegance and craftsmanship turns any morning routine into something special. 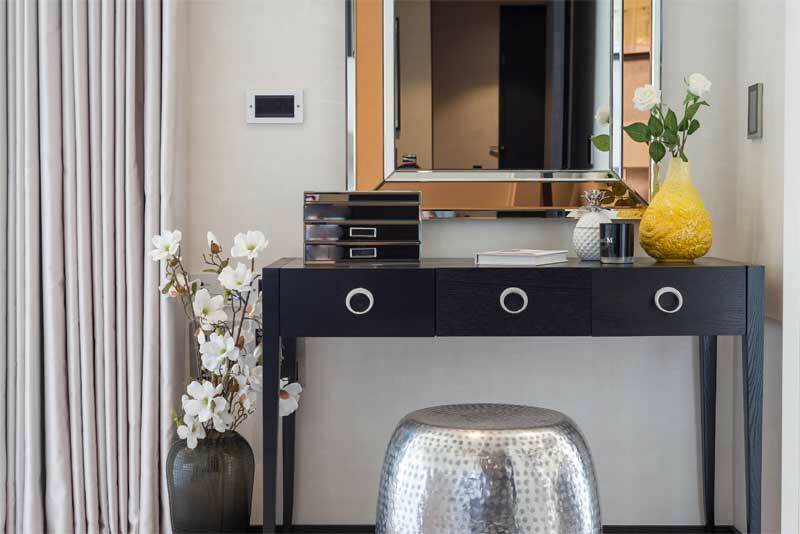 Styled with a glass framed mirror, silver drum stool and beautiful blooms, each decorative accent contributes to the bedroom’s panache and personality. Wondering how to incorporate the timeless appeal of fresh, modern interiors in a home or show flat? Our designers are here to help bring your vision to life. Get in contact today.